READ READ READ READ READ!!! Many of you are posting the same thing over and over again in the forum. Read through the forum and you will find a solution. 1. First, before you do anything, upgrade the bios on the board to the most recent version. Currently the most recent version is 0036. It solves massive overheating issues that can occur with the box, but i never experienced anything when running anything below 0036. 2. Install OS X 10.8 (or 10.8.2 if you've updated) to the box itself. If you are installing using 10.8 like me, it is not essential to update right away to 10.8.2, but i would do it anyway just to be safe. 3. Once installed, restart and run Multibeast with the configuration i have listed below. 4. Restart, and things will probably look a little weird graphically. 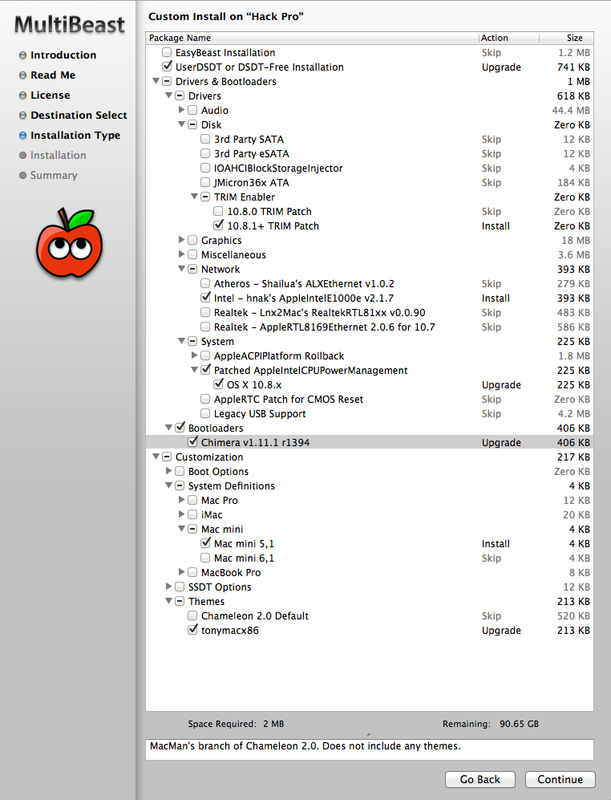 We need to patch AppleIntelFramebufferCapri.kext to make the graphics work properly. I have included the kext for you guys to install using Kext Beast. 5. Next we need to enable HDMI audio, as the box does not have AUX out capability. I have included a .zip file that explains how to do this, courtesy of toleda. This file also explains how to patch AppleIntelFramebufferCapri.kext if for some reason my file doesn't work for you. 1. Your graphics memory in your Bios MUST be set to 128mb. Your box will not boot unless you do that. In OS X, your graphics memory that it shows depends on the amount of memory you put in the box. If you have 8gb of RAM, youll have 512mb of graphics memory. Its weird, but it works. I'm looking into a fix. 2. Sleep does not always work for some users. The box barely uses any power so i just leave it on anyway. But for some reason its either a hit or miss with some people. 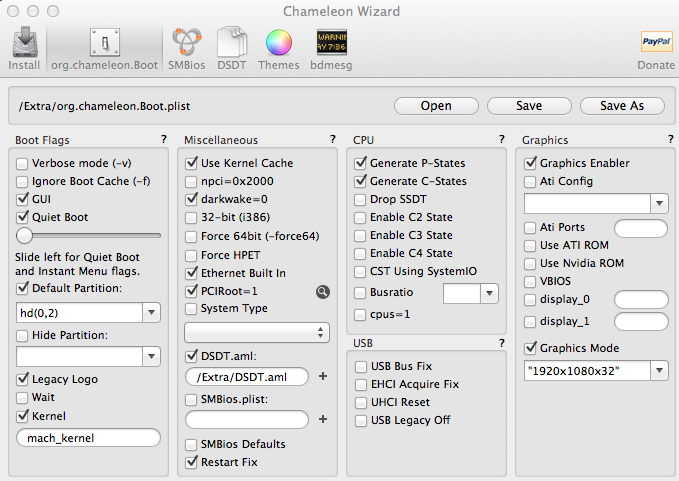 Try setting darkwake in your chameleon .plist to darkwake=10. Some users have seen success with sleep when using this setting. Including myself!!! Thanks sumsaykra-z for this tip! In some cases, sleep will only work for the first hour or so. During that time youll be able to wake the computer up no problem, but after a certain point in time, it just simply wont wake up. This may have something to do with the S4 sleep option in the bios (which i have enabled). I will continue testing. 3. The box DOES NOT come with a power cable, so youll need to buy that like i have listed above. It comes with an adapter, but no power cord. 4. In your Chameleon.plist in /Extra, make sure you place the graphics mode to whatever your display can handle. If youre running at 1080p, set your graphics mode to 1920x1080x32. There is a downside to this. If you switch your resolution at anytime (ie 720p) your entire screen will freak out and it will be very difficult to find your way around. I have not tested the box on a 720p display so i'm not even completely sure if 720p will work. If youre using an Apple Cinema Display, set the graphics mode to the resolution of that display. 5. For a true mac experience, use Chameleon Wizard to set the Timeout time on chimera to Quiet Boot. This way, the box will boot to desktop in about 10 seconds from cold boot. EDIT: You can use this guide to change the CPU speed from 1.7 to 1.8. I have changed mine, as you can see below. 7. If you are using the Dell DW1702 wifi/bluetooth card, install the kexts i have included to enable both functions. WORKS WITH SLEEP. Special thanks to faithie999 for the kexts on googlegroups. 8. The Apple USB-to-Ethernet Adapter does not work for some users when trying to enable icloud/appstore. 9. Some Thunderbolt devices do not work. For instance, my Thunderbolt to DVI adapter only works about 10% of the time. Something to keep in mind. 10. Bluetooth is kind of laggy when using two screens on the thunderbolt model. 1. 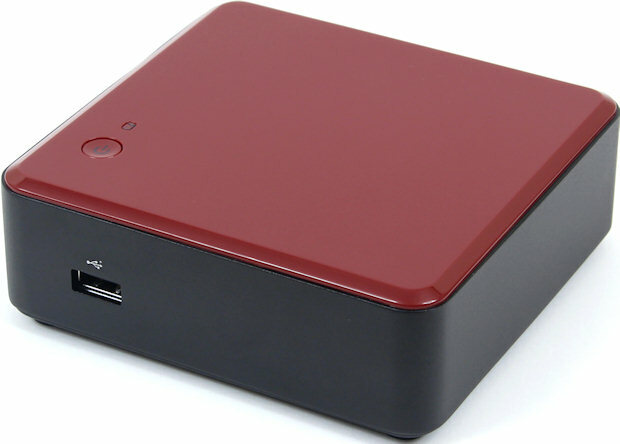 When i was first putting my NUC together, i set my SMBios to Mac Mini 6,2 using chameleon wizard. Then i got a notification from The App Store saying i had an update available for my particular model. I'm not sure if that update had any effect on my build whatsoever, but if theres anyone who would like to see the before and after effects of that update, report back with your findings. 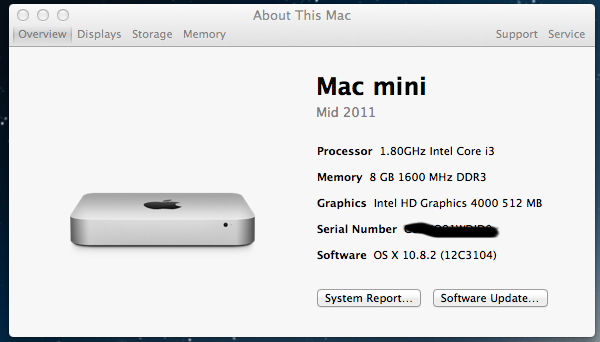 The update can not be obtained with definition Mac Mini 5,1. 2. For those of you looking for a USB sound card, this one should work. Geekbench score is 4763. Thats freaking awesome for such a little box. Aside from sleep not working for some users, everything on this little box works. HDMI Audio, speedstepping, thunderbolt etc. I can do everything on here that i normally would. Such as recording in Logic, watching full 1080p movies, and even playing N64 games haha (havent tried Wii or PS2 games). One issue i ran into was that my icloud and mac store was broken. I couldnt Login. I'll attach the files to fix that, as well as my DSDT so you guys can try that out too. Special thanks to everyone in the thread below that helped make this hack possible. If you have any questions, post below or check out the link. 9/27/13: 10.8.5. Install patched Intel cpu kext through multibeast before restart. Try darkwake=10 This may resolve your sleep issue for Mountain Lion. It did for my hack. Congrats! This is excellent news and tutorial for building a tiny machine. So sorry if this is a basic question (this is my first hackintosh/ time use osx), but I've googled around a bit and can't seem to find the answer. I'm using the non-thunderbolt edition and I'm trying to get dual monitors up and going. I've got it to where I have two monitors going, but they are identical to each other. Is it possible with the NUC to get them to be independent displays, and if so how? I see your post down below by "Issues" you mentioned darkwake=10. Did I miss that when I first went through this and my post was irrelevant? Sorry about that. Also, why do you have "Restart Fix" selected in Chameleon Wizard?